Success can mean many different things to different people. There is career success and personal success. Fitness goals are all about personal strength and motivation. This falls under the personal success category. If you goal is to get in better shape or lose a few pounds, then I will tell you the secret that will guarantee your success. And, if you can win at the game of personal challenges, you are more likely to succeed at career goals as well. Make your dreams come true by setting up a plan to achieve them. Goal setting and vision boards are powerful tools when you have your thoughts aligned with your dreams. So, you want to create successful goals that will actually make a difference for you. Before starting, remember that your thoughts become your words and your words become actions. Be aware of what goes into your mind before setting your intentions. Regardless of where you are now, any time is the perfect time to create successful goals! Why Can't 2016 be the Happiest Year of Your Life? We all want to be happier. Whether it’s eating better, making new friends, saving money, travelling more often, or anything else, the driver behind resolutions is personal growth and increased happiness in life. Here's the one trick that you need to increase your happiness. One simple resolution transitioned into one major lifestyle change for PumpUp member @danialani, who set a benchmark for herself to run 5 kilometers at least once a week during PumpUp's #MyResolution challenge in January 2015. So far, she's been doing better than good. In fact, Dania has been doing great by steadily improving her personal best times. "In 11 weeks I went from running 5 km in 38 minutes to running it in 32," she said gleefully. "I'm 2 minutes away from my ultimate goal. I'm so so close." In less than half a year, Dania stuck faithfully to her smart, measurable, and specific resolution for herself. Her progress is palpable; her updates exude happiness. By participating in monthly challenges with the PumpUp community, Dania is more committed to achieve her health goals than she has ever been in her life. "Love yourself because you're capable of incredible things," she professed. "With every personal best, I sure am loving myself more and more." Keep Dania pumped on PumpUp app @danialani and be sure to let us know how we can help you to achieve your personal bests as well! What are obstacles that are hindering you from springing into action? Let us know in the comments below or tweet us @PumpUp, we'd love to hear from you! 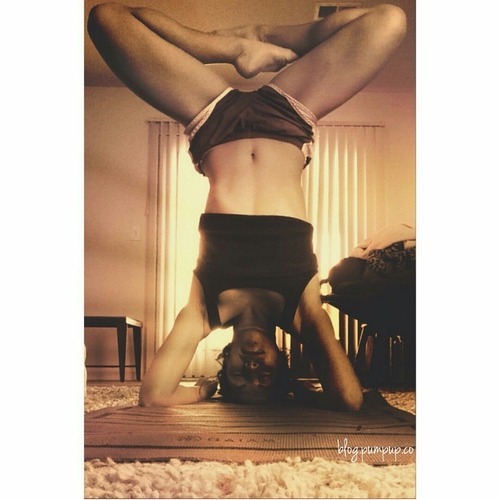 Thanks for planking it out on Day 3 of PumpUp’s #MyResolution photo-a-day challenge! Creative planks are always great to witness and a riot to perform, aren’t they? Remember to never sacrifice proper form for extra time in the pose. According to the Guinness Book of World Records, the longest plank to date was held for 4 hours and 26 minutes. @emily_swan (top photo) demonstrates some sweet plank variations to try! These isometric poses will work different parts of your body. @alexawinter (second row, left), among many others on the app, took this opportunity to plank it out in her kitchen! Ain’t no mountain high, ain’t no valley low enough for @k_c (second row, right). She climbed on top of Pinnacle Mountain in order to take this shot! @danelee (third row, right) explained that he does a lot of plank work in gymnastics. He decided to do his plank on two physioballs! Several PumpUp members went above and beyond generic resolutions. Theirs were specific, personal, and inspiring. @mjmartinez86’s photo (top) describes how she’s making resolutions to better herself, try new experiences, and improve upon how she interacts with those around her. @fierce’s cute resolution photo (featuring Disney’s Stitch) describes concrete and tangible goals such as eliminating fast food and saving up more money. Not only will these goals help her to live a healthier and fuller life, she’s rewarding herself as well. Our winner of the PumpUp swag prize of the day, @rynasaadi wrote down several resolutions for 2015. The ultimate and most important one to her, however, was to stop drinking soda this year. It’s achievable, realistic, and within the parameters of what she can actually do to make a big change. We’re proud of her! Sticky notes that @hannahds1999 wrote (bottom left) are vibrant reminders that you can paste around your room and carry with you anywhere. She’ll be a dancing queen in 2015, full of happiness, hydration, and exercise. @Mariasouele’s resolutions all work towards a specific goal. Her first is to organize her life by working towards a degree in computer science, finding a job, and waking up early in the morning. Her second goal is to lose weight, but for specific reasons and goals: to be fit (and have defined abdominals), to be confident (for an improved demeanour to those around her) and to be healthy (for her family). Finally, her ultimate goal this year is to be happy, intensely and immensely, for herself. Check out more #MyResolution posts from the pumpupapp by opening up the app! Success is achieved when we inspire wellness, together.Get motivated by millions to become the best version of yourself. 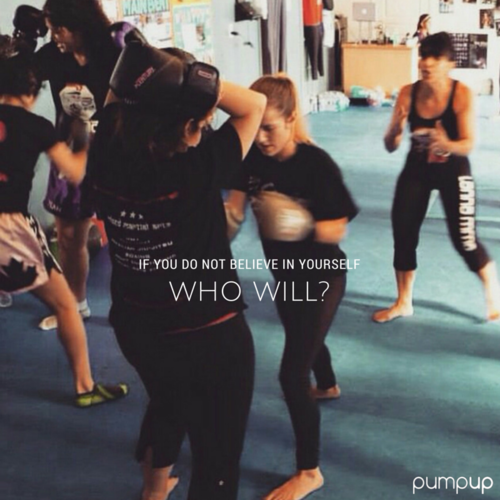 Let PumpUp encourage you along the way. Nothing is impossible! Share this video if you love #TeamPumpUp! The truth is: If you do not believe in yourself, who will? For a long time, my lack of confidence in myself limited and impinged upon several aspects of my life. I’m sure we all have this in common on different levels. When I was young I used to doubt myself and begin sentences with, ” I can’t do this because….”. I didn’t stick to habits because I didn’t believe I had the discipline. I didn’t push past my comfort zone. I was always finding excuses to justify why ”I couldn’t do it” instead of finding reasons why I could do it! All because I didn’t really believe I could. I can honestly say that now, I believe in myself like never before. That doesn’t mean I think I’ll never fail or quit: I will, and often will. And that’s OK. The trick is that I learned it’s completely fine to try and fail, to put yourself out there and not be perfect, to say hello to someone and have them not instantly love you, to create something and have people judge you. If you never try something new, something that will put you out of your comfort zone, you’ll never be able to grow. Failure, not being perfect, mistakes, not having people agree with me, not being completely accepted: these are not negative things. They’re positive. How is failure positive? It’s the only way we truly learn. For example: you can read a book on math, but until you try it and fail, you’ll never see where your lack of understanding is. The best way to learn something is to study it a bit, then try it, take practice tests, make mistakes, then learn some more. And repeat. How are mistakes positive? They’re little pieces of feedback necessary to grow and learn. How is being rejected positive? It means I’m growing beyond the absolutely socially acceptable realm. The best people in history were not socially acceptable: truth-tellers like Socrates, Jesus, Gandhi, Proudhon and Bakunin, Martin Luther King Jr., animal rights philosopher Peter Singer, unschooling pioneer John Holt, women’s rights activists, abolitionists, and many more. These things we’re afraid of — they’re actually desirable. We need to learn to see them that way, and embrace them, letting go of the fear. When we can get better at this — which takes a lot of practice — we can start to remove the things that hold us back. How to change the way you think: It takes a lot of practice. First and foremost, you have to start thinking with these two powerful words: I CAN. Say it every morning when you get up in front of the mirror. Every time, you will face a difficulty make a promise to yourself to say ”I can do this…I can surpass this and I will”, every time you are working out and you have a hard time doing a certain exercise, instead of quitting, push yourself to make 2 more. Once you master your brain, you will be capable to achieve great things. Believe that you can and you will. Everything is possible when you believe you can. But it all starts with the choice of making these changes. Chase your dreams until you make it. Whatever how much time it will get you there, fight for it, work for it! Believe in your dreams and stand for your dreams. Even in the midst of difficult times…you need to maintain the confidence and conviction that YOU CAN achieve what you want. Start by reading books about personal development. Put yourself out there, and be OK with not knowing if people will accept you. Stick to a habit and never listen to negative self-doubt that normally holds you back. For every negative thought, find 5 positive things to say about the situation. Repeat these positive thoughts a few times. Stick to it some more, and learn to trust yourself. Go into situations not knowing, and learn to be OK with that. Learn through repeated attempts that it’s OK to fail, that you can be OK in failure. New year, new you? 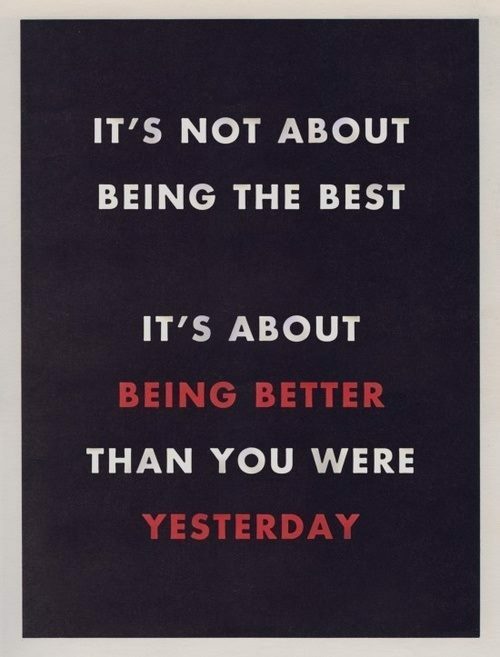 It isn’t easy, but you can achieve your 2015 goals for real. According to one study, 45% of Americans usually make resolutions for the New Year. Given that the U.S. population was just over 317 million at the start of the 2014 year, and that a dismal 8% are reported to successfully achieve their resolutions, this means a whopping 131 million Americans did not achieve their resolutions in 2014. Millions more around the world may have experienced this same failure rate. Why do so many people make resolutions, while so few succeed? The pre-frontal cortex is an area of the brain responsible for controlling one’s will-power among other important functions, including abstract problem solving and short-term memory. Asking the pre-frontal cortex to immediately adjust to a big, abstract, and daunting New Year’s resolution is like asking an untrained individual to perform Beyoncé’s choreography perfectly: it won’t work. Like a muscle, the pre-frontal cortex falters easily without proper training. This means that smaller and attainable goals will be easier to accomplish than larger ones. If you do these three steps when you’re making a resolution this year, you’ll have a greater chance of being successful. Be specific. 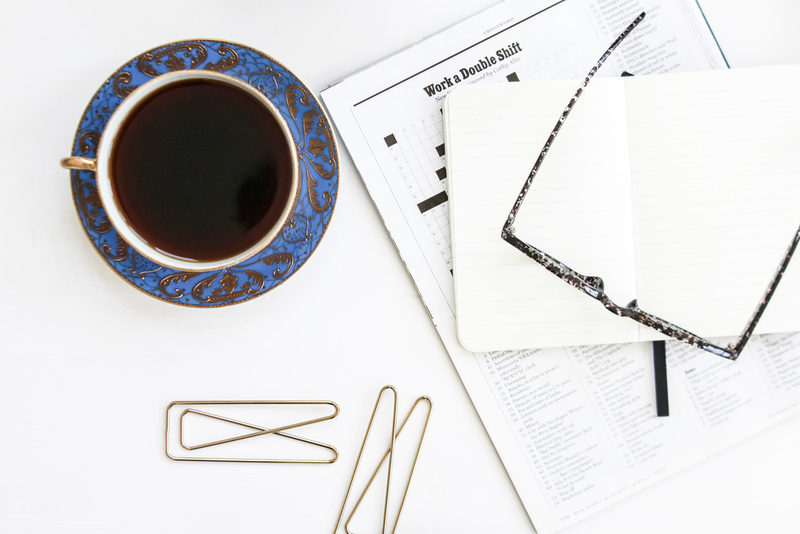 Set tangible goals with concrete deadlines that you can gradually work up to. Rather than making a generalized goal to, for example, run more often this year, train for a race instead. Make a schedule. Take time to create a plan and set mini-benchmarks for yourself. Reward yourself when you transcend tiny personal milestones along the way. Set aside specific days each week for your resolution, or sign up for something that already adheres to a schedule, such as a class. Don’t wait until you ‘have the time’ to work on your resolution. Track your progress. Make gradual changes and don’t expect too much too soon. Patience is everything. Mobile apps such as PumpUp are an excellent way to log your progress while other like-minded people cheer you on. It’s important to have a support team to keep you accountable. “New Years Resolution Statistics.” University of Scranton. Journal of Clinical Psychology via Statistic Brain (2014). Web. “U.S. Population Clock.” United States Census Bureau (2014). Web. Diamond, Dan. “Just 8% of People Achieve Their New Year’s Resolutions. Here’s How They Do It.” Forbes Magazine (2013). Web. Lehrer, Jonah. “Blame it on the Brain.” Wall Street Journal (2009). Web. Webley, Kayla. “Top 10 Commonly Broken New Year’s Resolutions.” TIME Magazine (2012). Web. Widrich, Leo. “The Science of New Year’s Resolutions.” Buffer Social.(2013). Web. Vanderkam, Laura. “7 Secrets from People Who Kept Their New Year’s Resolutions” Fast Company (2014). Web. A craftsperson masters her or his trade through repeated practice, care and continuous learning, and devotion to her or his purpose. Do the task even when you’re not in the mood. Procrastination is such a common problem that I believe it to be universal. How often have you told yourself, "I’m not in the mood to do this"? The task is probably difficult or confusing. It’s uncomfortable and you’d rather do things that are easier, that you’re good at. You’d rather clean your house or trim your nails or check your email than start a task that could have had the biggest impact on your business/life. But if we wait until we’re in the mood, we’ll never master anything. Instead, practice this: Plan to finish the most important tasks first, write them down in your agenda, and start doing them, no matter what. Don’t check email or social media, or go clean something, or do a quick chore or errand. Sit down, and do it. It will be uncomfortable. You can still do it even if it’s uncomfortable. Exercise even when you really don’t want to. Yes, this is the same thing as procrastinating — we put off exercise for many reasons, usually because it’s hard, because we ‘don’t have time’, and because we’d rather do something easier. Change your perspective. View exercise not as punishment, but as an act of self-care. You wouldn’t skip brushing your teeth for a week, would you? Your teeth would rot. Similarly, skipping exercise for a week rots your body. Sit with a little hunger. We tend to panic when we get hungry, and run for whatever piece of junk food is closest to us. What I’ve learned is that you can be hungry and it’s not the end of the world. We don’t always need to be stuffed and satisfied with crazy delicious food. Instead, practice this: Don’t eat if you’re not hungry. When you get hungry, sit there for a moment and turn to the hunger, and see how it really feels. It’s not so bad. This practice isn’t to make you starve yourself (not great), but to show you that a little discomfort won’t ruin your life, and that you can make conscious choices about when and how much to eat. Talk to someone about something uncomfortable. We avoid difficult conversations, because they’re not fun. They’re scary, uncomfortable. But that leads to all kinds of problems, including resentment, a worse relationship, worsening the situation, and more. Instead, practice this: When you have a problem with someone, instead of replaying the problem in your head, talk to the person in a gentle, compassionate way. Try to see the situation from their point of view, not just yours. Bring it up with a simple, “Hey, can we talk about ___?” And tell them how you feel, without accusing them or making them feel defensive. Ask them how they feel about it. Approach it with the attitude of finding a solution that works for both of you, that preserves your relationship. What you learn from this is that pushing through an uncomfortable situation will resolve a lot of difficult problems. Stick to a habit. One of the hardest things people face when changing their habits is that it’s difficult commit after the initial enthusiasm dies down. It’s easy to stick to a habit for a week — but what about pushing through the second and third weeks? 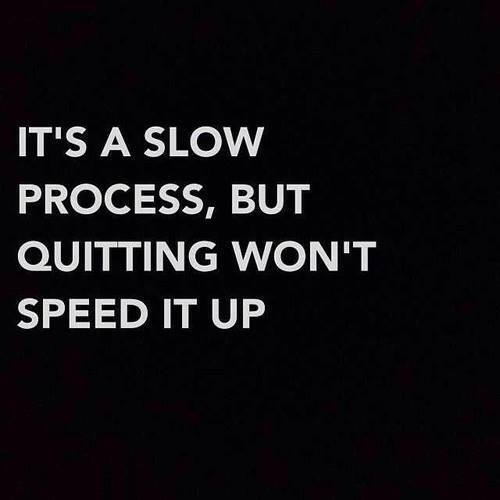 It gets a lot easier afterward, but a lot of people drop the habit too early. Instead, do this: Commit to one small habit for two months. Reserve just 5 minutes a day for that habit, and do it at the same time each day. Set as many reminders as you can so that you don’t forget. Track the habit on a calendar or log it, so you see your progress. Show up every day and do it. You’ll start to master the formation of new habits, which will open up all kinds of opportunities. Turn toward the problem. When we have a problem, we avoid even thinking about it. Think about whether you have one of these problems: you’ve been avoiding exercise, you’re overweight, you’ve been avoiding a major project, you put off dealing with your finances, you’re unhappy about some situation in your life. Often these are uncomfortable situations, and we’d rather not face them. Instead, practice this: See the obstacle as the path. Don’t avoid the obstacle (the difficult situation, or the problem you fear), don’t go around it, don’t ignore it. Turn toward it. See it. Acknowledge it. Figure out what’s going on. Find out how to navigate within the problem. You’ll find that it’s not easy, but not as bad as you thought, and you’ll be happy you did it. And more importantly: you’ll get stronger from facing the problem. See good in the activity. Discipline really derives from learning that you don’t need some incredible reward — there’s inherent good in just doing the activity. For example, if you’re going to eat healthy food, you don’t need to make it taste like your favourite dessert or fried food— you can just enjoy the act of eating fresh, healthy food in itself. If you’re going to exercise, it doesn’t need to give you a flat stomach or nice arms immediately— you can just enjoy the activity. Practice this: No matter what the activity, find the good in doing it, and the activity becomes the reward. Meditate. People think meditation is difficult or mystical, but it’s fairly simple. Practice this: Take 2 minutes to sit still, and focus on your breath, noticing when your mind wanders and gently returning to the breath. There are lots of other ways to meditate, but this is the simplest, and it shows you how to watch the urges that come up, and see that you don’t need to act on those urges. As the days go by, add more minutes to your meditation session. With time it will get easier to keep your mind clear of thoughts. You might not be good at these at first, but that’s why you practice. You’ll learn to get comfortable with discomfort, to show up even when you don’t feel like it, to stick to something even when the enthusiasm wanes, to not act on your urges right away, to enjoy any activity as a reward in and of itself. 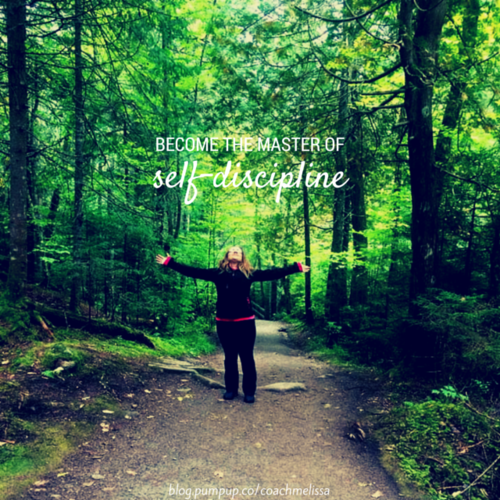 Does life need to be pure discipline and no fun? Of course not. But if you can enjoy any activity, in the moment, why not learn to master something that will pay off for you in the long run?